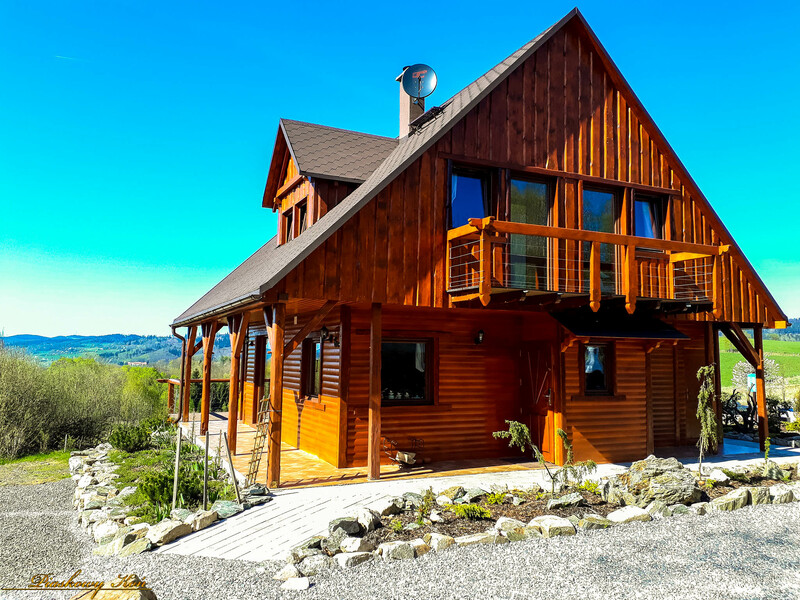 All season wooden cottage, sleeps 8 - 10 people, with fireplace, garden pool and large porch area - large Poland’s Lower Silesia - Karkonosze Mountains. This rustic cottage has a lot of space to comfortably spend time during the day, including a large living room with fireplace, and a covered terrace and at night with four cozy bedrooms. Total living space is 120 square meters. This "Sandy Horse" cottage is situated on an extensive two-hectare parcel of land small pond. It is surrounded by meadows, forests, and hills and features many beautiful views. On the porch there is a lockable storage room for various equipment (e.g., bikes, skis, saddles, strollers, etc.). There is also patio furniture (a table, chairs and sun loungers). During wintertime, guests are welcome to use sleds as there are many slopes near the cottage. This cottage is child-friendly. There is a baby cot, high chair, potty, and many toys and books. For younger children there is a fenced playground with a lot of toys and a sandbox. Around the cottage grounds, guests can enjoy a lot of space. There are no other buildings within 100 meters of the cottage. Parking is located next to the cottage and it's used exclusively for our guests. There is a swimming pool outside (available in summertime) with beautiful views of the mountains and valleys. On the ground floor there is a spacious living room with a fireplace and audio-video equipment (TV, Blu-ray, CD player, radio). Guests can also enjoy free wireless Internet access (Wi-Fi). We hope your time spent in the cosy living room with a burning fireplace will be relaxing and memorable. Also on the ground floor, the kitchen is equipped with everything you need for convenient food preparation, including a complete set of tableware (plates, cups, cutlery, etc. ), a set of pots for cooking on an induction stove, an electric kettle, dishwasher, a coffee maker and a microwave oven. There is also a big dining table and a child’s high chair available for use. For your comfort, there is also a bathroom with a shower on the ground floor and on the second floor. There are four bedrooms located on the second floor of the house. In each bedroom there is a double bed (king-size) or two single beds available (depending on your preferences). If needed, an additional double bed (sofa) is available to be set up in living room. In each bedroom balcony with beautiful views are available. The bedrooms are equipped with sets of bed linens and towels (bath and hand). In addition, there is liquid soap, toilet paper and a hairdryer in each bathroom. For guests with small children, there is a sleeping cot for babies, a potty, an overlay for the toilet seat and a footstool for children available. While the house is mainly heated with a fireplace during the winter, the bedrooms have electronic heating panels to ensure guests are as comfortable as possible during cold outside temperatures. Select date of arrival and date of departure and enter the number of people - excluding children up to 4 years of age (if they do not need additional - full-size beds). The calendar highlights the days possible to arrive or departure. In the next step, you will select options regarding your stay.